After scrutinizing the medical records of 1,000 people, an international team of researchers have determined that the risk of melanoma was cut by almost half when people took a daily dose of aspirin for at least five years. “Our data at least support the hypothesis that long-term steady aspirin use has an effect,” said study co-author Dr. Robert Stern, a professor of dermatology at Harvard Medical School and chief of dermatology at Beth Israel Deaconess Hospital in Boston. Previously, the only melanoma prevention advice cancer experts could give was for people to stay out of the sun and get their skin checked for early warning signs of the disease. If melanoma isn’t detected early, it can be deadly. Stern and his colleagues compared data from 400 melanoma patients to that from 600 healthy volunteers. The healthy volunteers were matched in age and gender to the cancer patients, some of whom ended up with more than one matched group. The 1,000 study participants were interviewed and asked about lifestyle habits and known risk factors for melanoma, such as light skin color and history of sunburns. They were also questioned about medication use. While melanoma is not as common as other types of skin cancer, it is the most dangerous and most likely to spread to other parts of the body. It killed nearly 9,000 people in the U.S. last year, according to the National Cancer Institute. 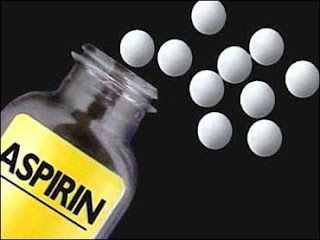 Although the study found no beneficial effect associated with statin use, it did find a substantial reduction in risk associated with the use of aspirin, which is an anti-inflammatory. There was also a hint that other NSAIDs, such as ibuprofen (marketed as Advil and Motrin) and naproxen (Aleve), might reduce melanoma risk if taken regularly over a long period of time. But the data on these drugs wasn’t as strong. Stern suspects that may be because far fewer people take these NSAIDs on a daily basis. Many middle-aged people take a daily baby aspirin to protect their hearts, he said. The use of other NSAID painkillers tends to be more sporadic. Melanoma isn’t the only cancer that appears to be affected by NSAIDs. Other research has shown that the medications can lower the risk of colorectal cancer . Nobody knows why NSAIDs might prevent cancer, but there are theories. Some researchers suspect that cancers like melanoma hijack the body’s inflammatory response to a growing tumor to bring more blood to the site and to help cancer cells slip past the body’s defenses and attach elsewhere, said Dr. John Kirkwood, director of the Melanoma Center at the University of Pittsburgh.